Yasiel Puig rookie cards are finally here. In today's hobby, baseball players normally have their first cards a couple of years before they make their big league debut. Some exceptions exist, but those are normally reserved for those who fast-track their way to the majors. Even then, there are usually at least a couple of Bowman sets that they're in wearing a MLB uniform. 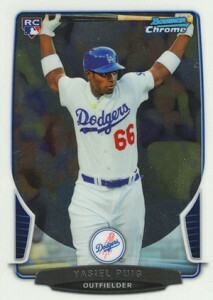 Entering 2013, there were only a handful of Yasiel Puig cards. Released by Leaf, they are unlicensed cards that are popular but still not regarded by most as true rookie cards. 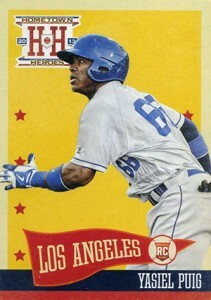 In the months following his Dodgers debut, Yasiel Puig cards popped up in more sets but as inserts. So by traditional definitions, still no rookie cards. Autographs, limited edition parallels with low print runs, minor league cards -- there was no shortage of cards. Just none of Puig in a base set. 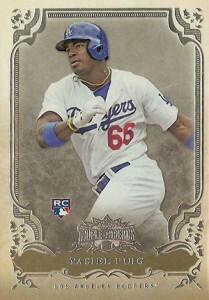 Finally, with the release of 2013 Topps Allen & Ginter Baseball, the first Yasiel Puig rookie cards arrived. And by the time the final 2013 sets are released, there will be plenty to choose from. Below is a list of all Yasiel Puig rookie cards. It's an evolving list that will continue to grow until the last set of the year is released. We've also limited it to cards that are part of a base set. 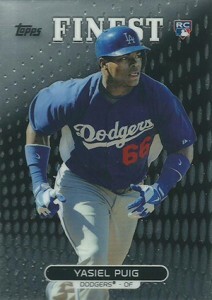 Click here for a detailed look at popular Yasiel Puig prospect cards released before his rookies. Please note that we'll continue to add to this list as more sets are released. Click on the card names to shop for singles on eBay. While the 2013 Bowman Chrome Yasiel Puig rookie is nice, it's the multitude of Refractors and the Prospect Autograph from the set that most will be chasing. Still, the base versions is an attractive card at a reasonable price. 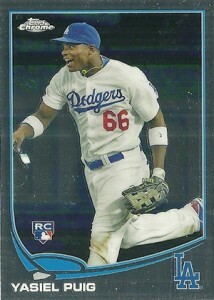 Looking for an affordable Yasiel Puig card that's an official rookie card? 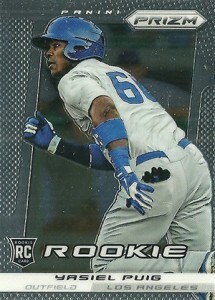 2013 Bowman Draft fits the bill, complete with a clean design that's easy to look at. Most collectors bust Bowman Sterling for the autographs. The base cards are often an afterthought. That said, they're quite rare given how few are in each box. 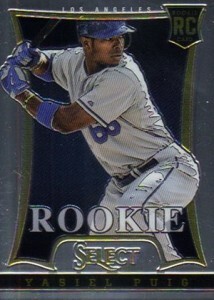 So even without numbering, this is one of the tougher Puig rookies to land. 2013 Panini Hometown Heroes opts for a bright vintage vibe. Invariably, some will love it, others will loath it. Whichever the case, it will likely be one of the flashy outfielder's cheaper rookies. As a new brand, it may not be available in the same quantity if not a lot of collectors break the product. 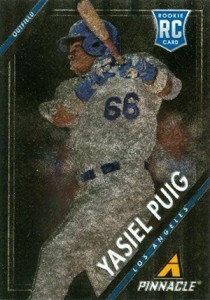 It's by no means rare, but it is something for Puig collectors to watch for. Like the similarly themed Topps Chrome card, it's the colorful parallels that garner the most attention. With so many exclusives coming from specific types of packs, building the full Puig Prizm rainbow could be quite the task. The first Pinnacle baseball set since 1997, there's a retro vibe to the name. Without a MLB license, appeal is somewhat limited without the logos and branding. It's not a knock against the card. It's just what many collectors prefer. On the flip side, that could be a positive for budget-minded collectors looking for a deal. Sticking with the Pinnacle tradition are Dufex-inspired (now called Nufex) Museum Collection and Artist's Proof parallels. After more than a decade off the diamond, Select returns as a chromium-style brand. 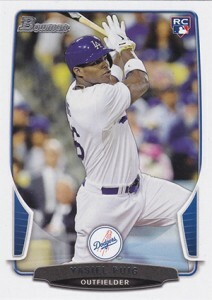 Puig is the only rookie in the set not to be autographed. As a result, it's somewhat reasonably priced. Prizm parallels are also popular. 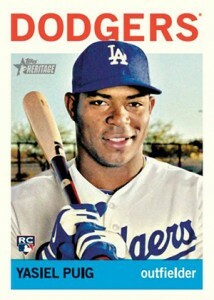 The 2013 Topps Allen & Ginter Yasiel Puig rookie card will forever be known as his first in a MLB base set. Not being a short print or boasting any sort of premium selling points, it should be one of the cheaper Yasiel Puig rookie cards down the line. Allen & Ginter is a very popular line and the print run is relatively large so it should be one of his easier cards to find as well. Following in the Allen & Ginter tradition, the card has different mini parallels. Puig also has an autograph in the set. 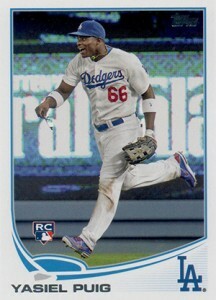 The 2013 Topps Chrome Yasiel Puig rookie card has a fun, expressive photo that's a little out of the ordinary. While the set's popular, the Refractors and other inserts (including autographs) overshadow the base card. There's also a horizontal variation short print (pictured). Another chromium-style option, this one's extremely affordable. It also has several Refractor parallels that add a chase element. Although not a rookie card, Finest also has a redemption for an autographed jumbo relic. It might not be autographed, but with a miniscule print run of just 75 copies, this card should generate some serious attention. There's also the fact that it comes from Topps' priciest product of the year. Included in the online-exclusive box set, this card takes on the 1963 Topps design. Although not as limited as the 2012 Heritage High Number set, this card could prove to be a little trickier than most to find as a single due to the fact that not a ton of sets will be broken. 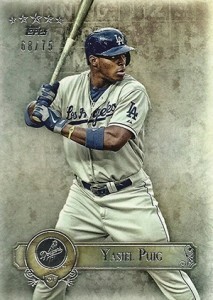 Similar to Bowman Sterling, the Triple Threads Puig rookie could easily get lost in the set's high-end shuffle. 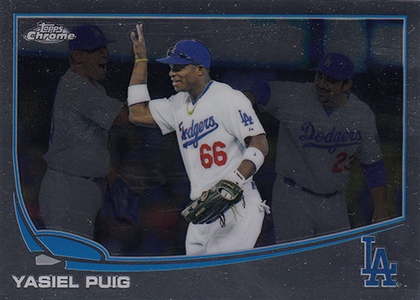 Unlike other rookies in the set, the Dodgers standout has a basic card that doesn't come with an autograph, memorabilia or serial number. 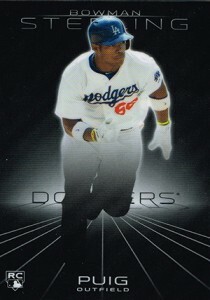 Puig does have them, but these aren't considered to be his official rookie card in the set. 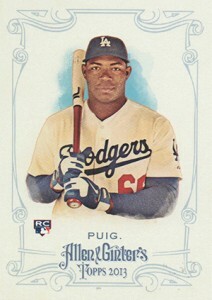 While the base version of this card is one of Puig's cheapest rookie cards, it has not one but three variation short prints that are much more pricey. 2013 TOPPS UPDATE # US46 Yasiel Puig RC PSA 10 GEM MT - PSA # 28436822 Dodgers! natespringfield � Already on there. No Topps Heritage High Number? Ron � That one I totally forgot. It’s there now. Thanks!